In the field of systems engineering (SE) you may already be familiar with, or at least have heard about, the burgeoning activity in topics of System of Systems (SoS), Enterprise Systems Engineering (ESE), and Complex Systems Engineering (CSE). There exists a fair amount of controversy as to the degree to which traditional (or conventional or classical) methods of systems engineering (TSE) are able to address our most difficult complex systems problems, or whether this brand of complexity requires some new ways of thinking, to paraphrase one of Albert Einstein’s famous quotes. In particular, transforming project management to a more systemic (rather than purely systematic) approach is highlighted. This tutorial/workshop facilitates a learning experience by 1) explaining and giving examples of the basic ideas behind complexity theory, complex systems behaviors, and CSE; 2) reviewing a multitude of related definitions to reach a better understanding of the terminology; 3) presenting CSE principles that may improve “mindsights” in ways that may help you accelerate progress in your SE efforts, especially in confronting the most difficult problems facing our world and/or in your respective activity domain(s); 4) providing a few of simple “chaordic” artifacts for characterizing your SE environment and what you are doing about it; and 5) suggesting an updated Complex Adaptive Systems Engineering (CASE) methodology of CSE that you might try applying. Teamed class exercises will stimulate creative thought and interactions among participants. All this and the ensuing discussions should further mutual understanding and better prepare you for future SE endeavors. Biography: Brian E. White received Ph.D. and M.S. degrees in Computer Sciences from the University of Wisconsin, and S.M. and S.B. degrees in Electrical Engineering from M.I.T. He served in the U. S. Air Force, and for 8 years was at M.I.T. Lincoln Laboratory. For 5 years Dr. White was a principal engineering manager at Signatron, Inc. In his 28 years at The MITRE Corporation, he held a variety of senior professional staff and project/resource management positions. He was Director of MITRE’s Systems Engineering Process Office, 2003-2009. 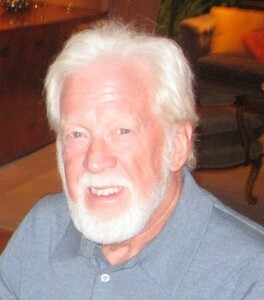 Dr. White retired from MITRE in July, 2010, and currently offers a consulting service, CAU←SES (“Complexity Are Us”← Systems Engineering Strategies). Biography: Prof. van Houten is the head of the “Design Department” of the Faculty of Engineering Technology at the University of Twente. The department is also comprising the chairs of Product Design, Product-Market relations, Packaging Design and Management, Maintenance Engineering and Integrated Product Life Cycle Management. 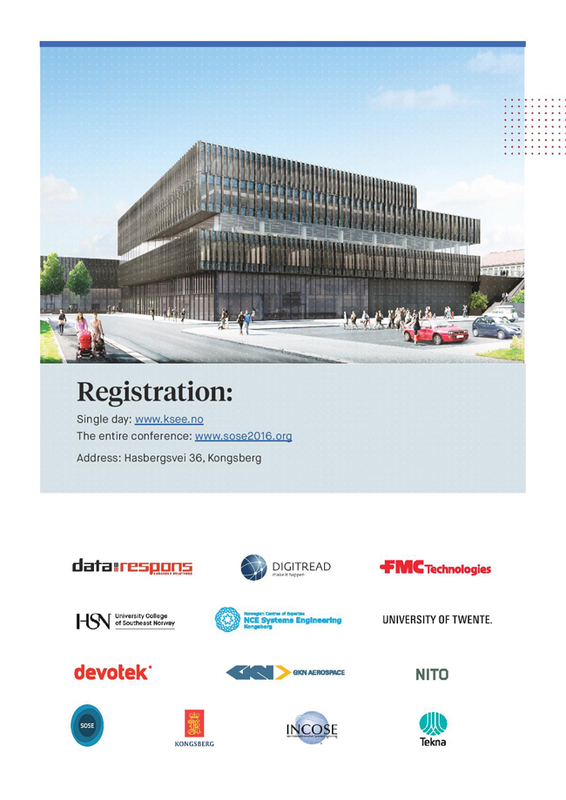 The group consists of more than 60 staff members and 30 PhD students, which are active in a wide area of research in Design Integration and Process Modeling. 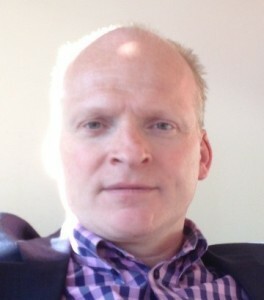 Prof. Van Houten is member of the High Level Group of the Enabling Technology Platform “Manufuture” of the European Commission, the national Smart Industry Forum and of the foundations STODT (Foundation Technical Education and Service Twente), Fris (Creative Industry) and Leo-center for service robotics. In April 2009 Prof van Houten has been elected as member of the Deutsche Akademie der Technikwissenschaften (acatech) and in August 2010 he has been elected President of the International Academy for Production Engineering (CIRP). In 2011 he has been elected as foreign member the Royal Flemish Academy of Belgium for Science and the Arts (KVAB). In that year he also became member of the Berliner Kreis (Wissenschaftliches Forum fuer Produktentwicklung e.V. ), the Wissenschaftliche Gesellschaft fur Produktentwicklung (WiGeP). On 4 June 2012 Prof van Houten was awarded with the 2012 Gold Medal of the Society of Manufacturing Engineers (SME). 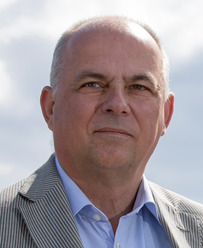 On 12 June 2012 Prof van Houten has been elected as Fellow of the Design Research Society (DRS) and as Fellow of the International Society for Nano Manufacturing (ISNM). 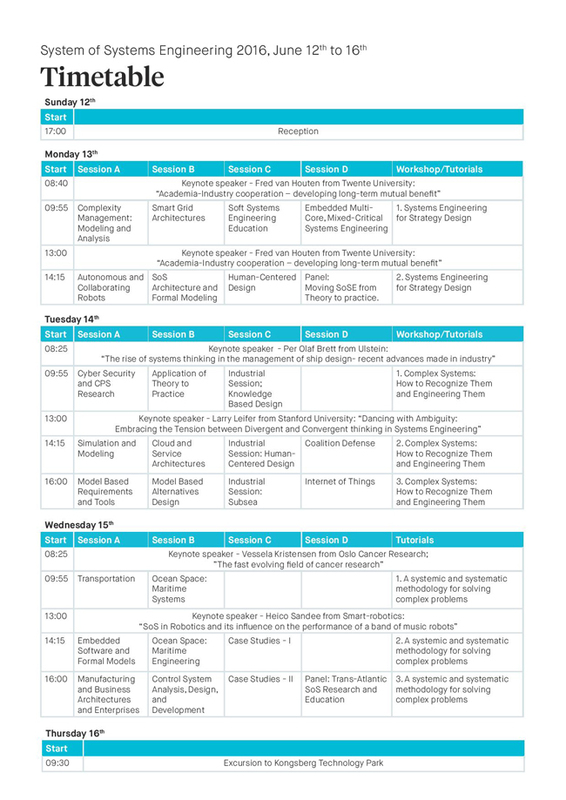 Prof van Houten has published more than 150 scientific papers and has presented 34 invited keynote papers. He has been chairman of the Editorial Committee of the CIRP annals from 2000 until 2006. At present he is member of the editorial board of several international Journals. Abstract: We aim to translate Systems Biology approaches into medical research and practice. In the era of “precision revolution”, moving from crowd based, best-for-all treatments towards patient tumor-tailored medicine, a clear clinical need is to identify amongst the enormous amount and variety of molecular markers generated by systems biology those that should be added to the current set of clinical predictors to improve diagnosis, prognosis and treatment response. Scale-free rank-based Bayesian meta analysis methodology as well as computational and mathematical micro-scale cancer models will be applied. Prior biological knowledge will be crucial in restricting the model space: Structures will be based on broad biological knowledge of interactions between different data types derived from our current studies, and Bayesian priors will utilise experimental and text-mining evidence (representing unsupervised knowledge). This information will be then used to develop informative priors, which will be introduced in a hierarchical Bayes analysis of the -omics data. Creating algorithms that include available genome-scale tumor molecular data simultaneously generated from each tumor, by DNA sequencing, mRNA and miRNA expression profiling, DNA copy number alteration (CNA)and methylation data, we envision to provide a “barcode” vector of the disease of each individual patient, which will enhance clinical decision-making. We have generated all the molecular data from both discovery and very well clinically characterised validation datasets for a Proof of Concept. We will be delivering reliable and powerful analytical and simulation results to refine the experimental design for future prospective clinical data. Our mathematical/computational models will lead to better understanding of the biological processes which play a fundamental role in complex disease processes the key common underlying mechanisms in disease, which will enable clinical decision. Vessela N. Kristensen is a Professor I at the Medical Faculty of the University in Oslo (UiO) in Clinical Epidemiology at the Department of Clinical Molecular Biology and Lab science (EpiGen), Akershus university hospital, and Group Leader at the Department of Genetics, IKF, Det Norske Radiumhospital. 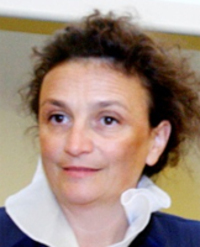 She has been also Professor II at the Centre for Integrative Genetics, University of Life Sciences, Ås and assistant professor at the Advanced Technology Center led by professor Stephen Chanock at NCI, NIH, Bethesda. Kristensen has visited the Berzelius Laboratory at Karolinska to work on the functional characterization of polymorphic CYP2E1 together with the group of professor Magnus Ingelman Sundberg. She was also granted a fellowship to study the aromatase (CYP19) in the lab of dr. N. Harada at Fujita Health University, Nagoya, Japan. 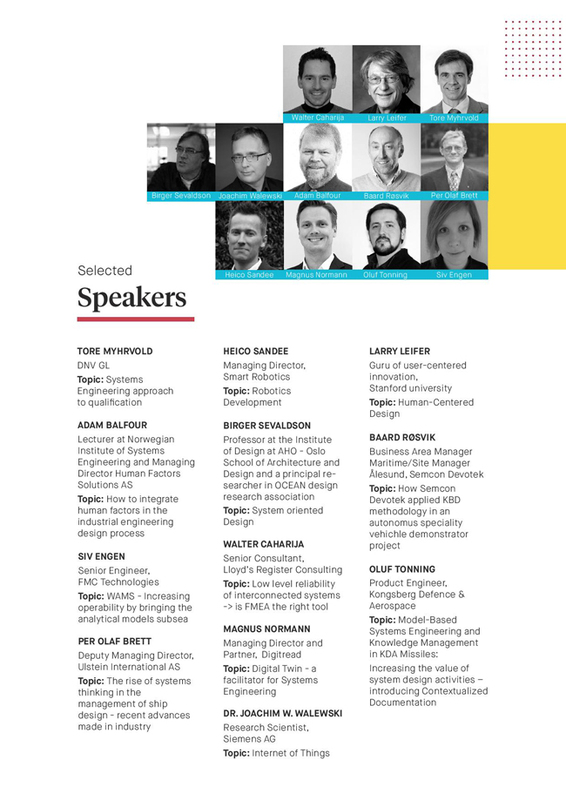 Abstract: This key note presentation addresses the challenges of improving the systems based ship design approach by suggesting how current systems thinking can conceptually and in practice be successfully applied to inventive ship design by means of alternative and enhanced design methodologies. Recent experiences by the author shows that too little focus and time are spent on the new building phases upstream and downstream in a new building project to achieve overall project effectiveness. Upstream, a proper dialogue with the decision-makers and project stakeholders more generally, about their preferences and objectives must be facilitated and catered for. Downstream, it is paramount that better focus is set on where to spend time, use expertise and introduce or save costs and time to secure a successful realization of the new building project. Not only a significant vessel must appear, but the timely delivery of it at agreed upon quality and price and its goodness of fit for purpose and market are paramount. It is suggested that advances and significant improvements can be made to existing ship design approaches in applying multi-disciplinary theory and systems thinking approaches and social science research contributions. It is argued that more effective ship design solutions and the process complementing it can emerge out of systemic-based ship design methodology and critical systems thinking. A discussion of the early application of state-of-the-art systems’ thinking and systemic-based design methodology and their resulting advances are shared. Limitations and suggestions for further advances of the methodology and its practice are discussed. Biography: Dr Per Olaf Brett is currently the Deputy Managing Director in Ulstein International AS. As a Deputy Managing Director he is responsible for business development, market analysis, strategic products and services research & innovation and coaching and mentoring. Dr Per Olaf Brett received his Doctor of Business Administration (Ph.D./D.B.A/Dr.Oecon) from Brunel University, Henley Management College, UK. He has a Master of Business Administration (M.B.A) from HMC, UK and an Advanced Postgraduate Diploma in Management Consultancy (ADipC). He is a Military Academy Graduate – Special Duties, the Royal Norwegian Navy Bergen. He also has a Bachelor of Science w/Honours (B.Sc.) from the Kings College University of Newcastle upon Tyne. From 1977 to 2007 he worked in Det Norske Veritas AS (DNV) Norway with Management positions and international assignments. 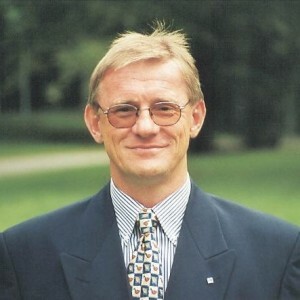 He has been President (CEO) of the International Loss Control Institute Inc. in Atlanta, Georgia, USA from 1991 to 1994 and Managing Director of Computas Expert Systems AS in Oslo from 1989 to 1991. Dr Brett is also holding a Professorship in Shipping at the Norwegian School of Management (BI), Institute for Strategy and Logistics Oslo and a Professorship in Management of Marine Design at the Norwegian University of Science and Technology (NTNU) Faculty of Marine Science and Technology Trondheim. Title: Micro meets macro and a new Klondyke for System Architects and System Thinkers is created. Abstract: The possibility to create vast complex system-of-systems based on communicating subsystems is enormous. We have just set out on a journey of a new era. The development is all around us and it involves all social layers in our societies as it spans around the globe. Cyber Physical Systems or Internet of Things also brings new opportunities and challenges to our nations’ procurement organizations to move away from buying complete systems and start to buy subsystems and become lead integrators. One driver for this is to increase the competition between the suppliers another driver is the mixture of subsystems various life times and also the possibility to utilize technology development in a smoother way. Regardless the incentives this trend put a pressure on the Defence Materiel procurement organizations as well as other Governmental materiel procurement organizations such as the Police, Coast Guard, Health Care etc., when it comes to employees who can handle system design and management of system-of-system solutions based on plug-play technology on a macro level. The role System Architect, which has existed for a long time in the Software industry, is therefore now gaining a new interest with focus on higher levels in the system hierarchy. Systems Thinkers are also a category of people which gain in popularity since the ability to handle the transformation from a high level capability into system-of-systems design and vice versa on the new higher and by that far more complex system level is not something that regular engineers/Software Engineers are used to do. Therefore there is a great future for Software Engineers who move out of the micro world and learn more about the macro world and the application domain as in cars, houses and airplanes as well as System Engineers which needs to get more involved with Software/Hardware Engineers in order to think the Big Pictures, do the correct System-of-Systems Engineering and at the same time create value to their organizations/companies. Biography: Max Berthold is currently working as project manager for Sweden’s new Ground Based Air Defence system at the Swedish Defence Materiel Administration (FMV). He also holds the position as Competence Manager for Systems Engineering at his office. As Competence Manager Max is responsible for the Systems Engineering training at FMV. 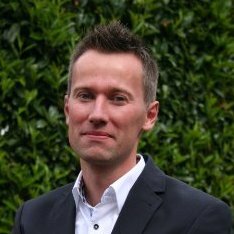 Max has a MSc Electrical Engineering degree as well as an MBA in Business Development and he is also a former technical officer from the Swedish Armed Forces Ground Based Air Defence Regiment. The last 10 years Max has been deeply involved with Systems Engineering and especially issues related to System-of Systems as FMV’s former Director of Technology and Product coordination where one of Max’s responsibilities was to manage FMV’s product portfolio. As Director of Technology and Product coordination Max also handled FMV’s technical processes and the organization’s implementation of the Life Cycle Model ISO 15288. Max has been an individual INCOSE member and FMV’s representative in INCOSE’s Corporate Advisory Board the last 10 years. He has also been the Corporate Advisory Board’s Co-chair and Chair the last 4 years. Max is a Certified Systems Engineer Professional. 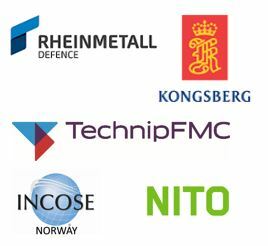 As FMV’s former project manager for Nordic Defence Cooperation (NORDEFCO), Max also has experience from cooperation among the Nordic Nations regarding Systems Engineering and their National Defence Procurement agencies. Abstract: Over the past thirty years, a powerful methodology for innovation has emerged. It integrates human, business and technical factors in problem forming, solving and design: “Design-Thinking.” This human-centric philosophy integrates expertise from the design, social, management, and engineering sciences to create a corpus of behaviors that are best implemented by small high-performance project teams. It produces a vibrant interaction environment that promotes creativity and rapid learning cycles through conceptual prototyping. The methodology has proven successful in the creation of innovative products, systems, and services. Design-thinking works. Industry and academia are subscribing to boot camps and immersive workshops, and corporate re-organization. Teams of industry, government and education experts are tackling complex problems and finding powerfully adaptive solutions. The time is right to apply rigorous academic research to understand how, when and why design thinking works and fails. It is time to create next generation design thinking behaviors and supporting tools. Through courting ambiguity, we can let invention and innovation happen even if we cannot make them happen. We can nurture behaviors that increase the probability of finding a path to innovation in the face of uncertainty. Emphasis is placed on the questions we ask in balance with the decisions made. A suite of application examples and research findings will be used to illustrate the concepts in theory and in practice. 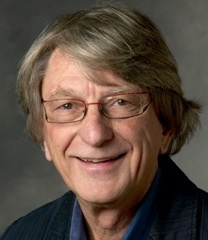 Biography: Larry Leifer is a Professor of Mechanical Engineering in the School of Engineering at Stanford University. He joined the faculty in 1976 after serving as an assistant professor at the Swiss Federal Institute of Technology, Zurich, and 4 years at the NASA Ames Research Center’s Human Information Processing laboratory. His education credentials include a Bachelor’s degree in Engineering Science, Master’s degree in Product Design (art), and PhD in Biomedical Engineering (neurosciences). He has served as founding director of the Stanford Veterans Administration Rehabilitation Engineering R&D Center; Smart Product Design Lab; Center for Design Research (CDR); Stanford Learning Lab; and Hasso Plattner Design Thinking Research Program at Stanford. His teaching-laboratory is the graduate course ME310-Global, “Industry Project Based Engineering Design, Innovation, and Development.” Research themes include: 1) creating collaborative engineering design environments for distributed new product innovation teams; 2) instrumenting that environment for design knowledge capture, indexing, reuse, and performance assessment; and 3), design-for-sustainable-wellbeing. His top R&D priorities in the moment include, d.swiss, human-robot teamwork relationship design, and the notion of a pan-disciplinary PhD program in Design Thinking. His top honors include an honorary doctorate from the Royal Institute of Technology, Stockholm, SE; honorary fellow of the Design Society; and visiting Professor at the University of Tokyo, JP; Swiss Federal Institute of Technology, Zurich, CH; and the Norwegian Institute of Systems Engineering, Kongsberg, NO. Abstract: The complexity of robotic systems is increasing at a high rate. As Moore’s law is still with us, computing power is not restricting us to significantly extend our system boundaries and to use complex algorithms – like artificial intelligence – to involve all data we can reach over the internet. Moreover, with robots coming out or their cages, collaborative robots even bring the human body and mind within the system boundary. To deal with this complexity, the robotics community relies on a multitude of tools, software platforms and data processing algorithms. Nevertheless, robotics is heavily lacking of methods to make the right architectural decisions to guarantee the performance of these Systems-of-Systems. Therefore, connecting the worlds of Robotics and Systems-of-Systems Engineering has great potential for both fields. 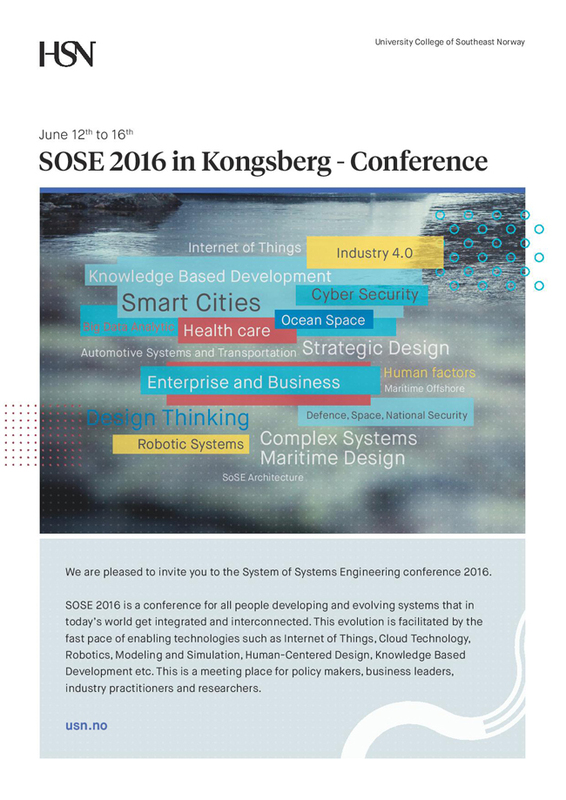 Two examples will be presented to illustrate how robotics and SoSE relate. The first example elaborates upon the SoS challenges of the Industry 4.0 movement, and how the middleware platform called ‘ROS’ – Robot Operating System – controls the interactions between the systems in a loosely standardized manner. The second example illustrates how a band of music playing robots (www.teamdare.nl) has emerged from individually developed robots, keeping in mind that for a band to sound right a carefully thought through joint performance is crucial. The right timing, dynamics, tempo, and tuning has to be realized to ensure the appreciation of the audience. Biography: Heico Sandee is managing director of Smart Robotics. Heico has a doctorate and over 15 years of experience in robotics development. From 2010 to 2013 Heico was the robotics program manager at Eindhoven University of Technology and was platform manager of RoboNed, the Dutch robotics platform. Heico (1978) received his MSc degree in Electrical Engineering from the Eindhoven University of Technology (TU/e), The Netherlands, in 2002. In 2006 he obtained his PhD degree in the Control Systems group of the faculty of Electrical Engineering, TU/e, on the subject of Event-Driven Control, in the Boderc project at the Embedded Systems Institute. In 2005 he visited the Mechanical Systems Control Laboratory at UC Berkeley, California, USA, for which he received an NWO grant. From December 2006, he worked as a mechatronic system developer at Océ Technologies. From 2010 until 2013 he was program manager at the Robotics at the Eindhoven University of Technology. From 2013 until 2015 he was Technical Manager at Alten Netherlands. May 2015 he co-founded Smart Robotics. Heico’s personal interests are music, sports and robotics (www.teamdare.nl).